The term sciatic describes a set of symptoms that can include lower back pain, hip pain, burning or tingling down the leg, and weakness in the leg. Sciatica typically only affects one side of the lower body. To understand sciatica, we need to look at how the sciatic nerve is formed and its course in the body. The sciatic nerve is the largest single nerve in the body. It is made up of the nerve roots that branch off of the spinal cord in the lower back. The sciatic nerve can become irritated for several reasons, including narrowing of the lumbar spinal canal, lumbar disc degeneration, muscle spasm in the lower back or buttocks, and irritation due to pregnancy. While this may not be the first thought that comes to mind, many cases of sciatica may start as a result of a spinal misalignment that happens at the very top of the neck. Your atlas (C1) vertebra bears the weight of the head, and also has the greatest range of motion of any other bone in the spine. Because of how freely movable it is, it is particularly prone to misaligning. When this happens and the weight of the head is carried off-center, it forces the entire spine to compensate. This results in shoulders and hips that are uneven, which leads to abnormal muscle tension and unequal weight bearing from left to right. Over time, this can cause significant strain on the vertebrae and discs in the lower back, which can aggravate the sciatic nerve. In order to address the cause of the sciatica, it is necessary to begin where the problem started – at the top of the neck. By doing so, we are not merely chasing around symptoms. We are looking to accomplish lasting results by getting to the root cause of the issue. At Mountain State Wellness, we use an approach to upper cervical chiropractic care that is very gentle and effective. Once we are able to correct the position of the atlas, the compensations throughout the rest of the spine can clear up naturally, leading to relief that is more than just temporary. 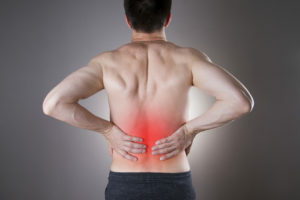 Back pain is something that nearly everyone will experience at some point in life. From picking up your children to poor posture behind your desk at work, back pain can range from just a dull ache to sharp, severe pain. Up until recently, the prevailing thought was to reach for some over-the-counter nonsteroidal anti-inflammatory (NSAID) medications, such as aspirin or ibuprofen. However, new research suggests that there is no significant relief to be gained from those drugs and that the risks associated with NSAIDs may not be worth the small benefit they might provide. In the study, data on over 6,000 patients with back pain were analyzed, and it was found that only one out of every six patients reported a clinically significant decrease in their pain after two weeks of NSAID use. This was determined to be no better than the results of using a placebo, but the NSAIDs came along with risks of developing gastrointestinal bleeding and cardiovascular problems. Many causes of back pain are spinal in origin. The spine is a complex network of vertebrae, muscles, tendons, and ligaments that all work together to keep things functioning properly. A normally working spine allows us to go about our daily activities comfortably, whether they involve sitting, standing, walking, participating in sports, or anything in between. When back pain arises and doesn’t resolve within a few days, then there’s a good possibility that the spine is not doing its job as it should. The spine houses and protects the delicate tissues of our brainstem and spinal cord. When vertebrae shift away from their normal alignment, it can put pressure on these nerves and cause muscle spasm, postural distortions, abnormal sensations, and more. Many spinal issues begin when the atlas, the topmost vertebra in the spine, misaligns. Like a chain of dominoes, the spine must twist and turn to compensate for the fact that our head is not being carried in a neutral position. This can manifest as mid-back pain, low back pain, sciatic nerve pain, and even problems with the knees. Correcting the atlas gently and specifically is our focus at Mountain State Wellness. When the atlas is restored to its normal position, the rest of the spine can relax and realign. Upper cervical chiropractic is a natural way to address ongoing episodes of back pain, without the risks associated with medication use. If you are dealing with low back pain, you’re in good company. Approximately 80% of adults will experience low back pain at some point in their lives. Low back pain is the most common reason for missed work days as well as injuries sustained on the job. It’s a condition that doesn’t discriminate either, with men and women equally as likely to develop it. When looking for treatment options, it’s important to consider the spine as a whole. In order to properly rid yourself of low back pain, you need to pinpoint the root cause of the condition. In many cases, the cause of lower back pain can be traced up to the top of the spine—the neck. While this might seem strange at first, the entire spine is connected and works together to protect your spinal cord. When the uppermost vertebra in the neck, your atlas, is out of alignment, it creates abnormal spinal cord tension which leads to a disturbance of signals being sent between the brain and body over the nerves. The misalignment of the atlas can cause lower back pain because it causes abnormal muscle tension on one side of the body. When the head is tilted, it causes the shoulders and hips to become unlevel, which can easily trigger low back pain and discomfort. In a case such as this, treatments to the lower back might provide some temporary relief. However, since the real source of the problem is coming from the upper neck, that is what needs to be corrected in order to realize a more permanent solution. 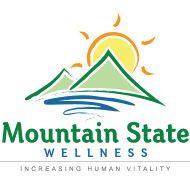 At Mountain State Wellness, we are focused on finding the root cause of the problem, which is the way to obtain lasting results. Our upper cervical approach is extremely precise and gentle and can lead to the resolution of chronic low back pain. 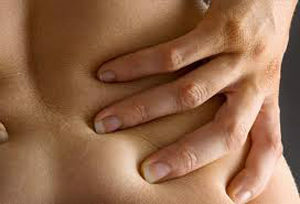 Burning, lancing, stabbing – these are all ways to describe the terrible pain of sciatica. 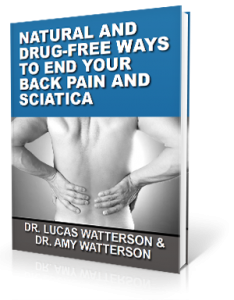 Sciatica refers to pain that occurs along the course of the sciatic nerve, which runs from the lower back, through the buttocks, and down the back of each leg. In really bad cases, the affected leg might become numb or even weak. No two sciatica cases are exactly alike. Walking might give some people relief while sitting is painful, or it can be the complete opposite. Regardless, if you’ve experienced the pain of sciatica, you’ve found yourself looking for relief. While medications may take the edge off the pain temporarily, if there’s a spinal issue, the results won’t last. The entire spine is connected by a series of joints, discs, muscles, tendons, and ligaments. A problem in one part of the spine will, sooner or later, impact other areas of the spine. The most common pattern we see is that a misalignment in the upper part of the neck will start a domino effect of compensations throughout the spine and ultimately cause muscle spasm and unequal tension on the lower back. Many times in our practice, we see patients who have had various types of treatments on the lower back to try and get relief from sciatica. The one thing that these people have in common is a specific misalignment of the uppermost vertebra in the neck, the atlas. Because the atlas has the most range of motion of all of the other vertebrae in the spine, it is more vulnerable to misalignment. 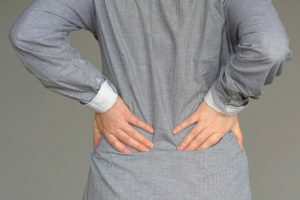 This is what sets off the compensation in the lower back, leading to sciatica. Correcting the atlas is correcting the problem at the root. Given enough time for the body to heal, maintaining normal atlas alignment can allow for those compensations to clear up naturally, relieving the tension on the lower back and sciatic nerve. This is what will give you the lasting relief you’ve been looking for.